Discussion in 'Free to Play' started by Chops, Jan 6, 2019. Hey gents! Not sure if yall noticed or not, but DMF profession quests were changed to give +5 skill points to BFA level professions. Well, theyre actually giving +5 to your highest expansion, whatever that may be. Which means those of us who were lucky enough to unlock Panda cooking can get +5 points every month. Which, for those of us who arent masochistic enough to grind tiller rep, is good news! can any1 confirm that the bug which resetted your profession skill to 100 when doing dailies is gone with new BfA profession changes. got northrend fishing maxed on my vet and wanna go for the DMF and SW fishing dailies, is it save to do so? Also a little thing I noticed, did dailies last night at 12am as soon as the DMF started, went to sleep and 8 hrs later could do the dailies again, meaning an extra day of dailies/rep practically. Good for those farming the insane title. If this is old news I apologize! Yes sir, all safe to do the dailies now. I’ve been doing them for a while with no issues. But this, I suppose, does not apply for the proffession quests. Not sure. Could anyone confirm? In 9 months I will be done, unless what Remique said is true. Any ideas why or how to get 0/100? Did you not get a skill up from the DMF profession quest? Or the cooking daily? 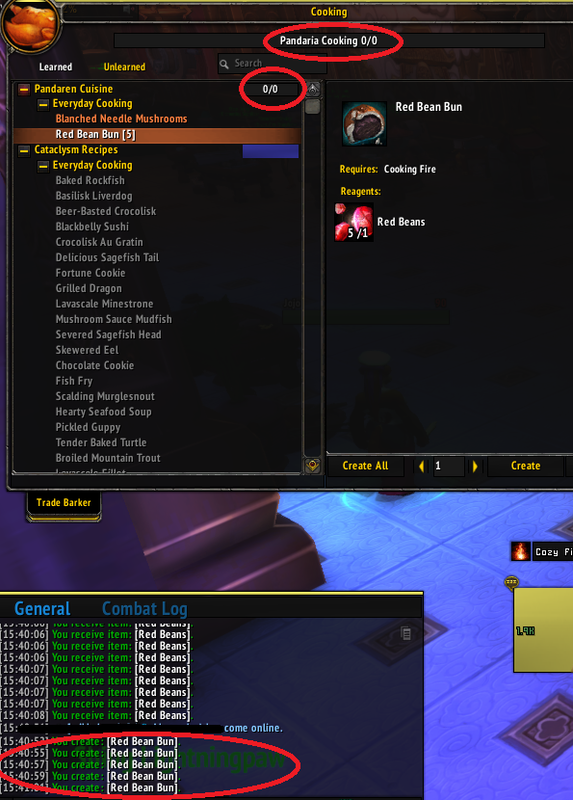 If you learned Pandaren Cooking before 7.3.5 (I think), you can train it up to 45-ish as a Starter Edition player. If you learned it after the patch dropped, you will be stuck at 0/0 with access to two recipes, regardless of Starter Edition or Veteran status.